Our Saddle Stitched soft cover books are an affordable and flexible solution for your book needs. Makes a great look book or affordable solution for multiple family gifting. 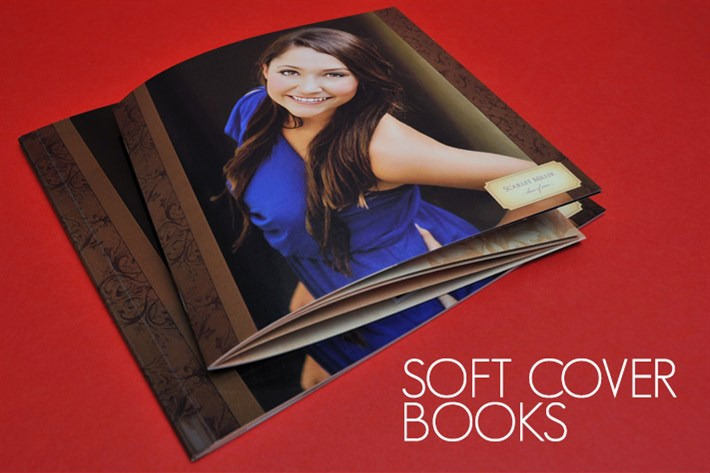 With Several options and sizes available you can truly customize this book to your specific needs. Saddle-Stitched Books - With our Saddle-Stitched Books, printed pages are folded in half and stapled at the spine. Saddle-stitched books come in 3 different sizes, including 6.5x6.5, 9x6, or 8x10, only comes with 12 pages/24 sides including cover. Matte - Matte paper is acid free and is typically selected by designers for its archival quality and timeless appeal. With a soft, smooth surface, it provides velvety solids and natural-looking prints. Semi Gloss - Semi Gloss paper offers a high quality, extremely smooth semi-gloss surface providing for excellent contrast color reproduction. Linen - Linen paper has a subtle, yet luxurious linen pattern. It presents exceptional print clarity and accepts delicate type well. Pearl - Pearl Paper offers a subtle shimmer to any design. This rich, luminous effect is achieved by combining natural minerals with organic pigments. It is not recommended for printing delicate type and fine details; the luminous effect and paper surface make reading small text difficult. Smooth Cover - Smooth paper is coated and offers an excellent white allowing for vibrant color rendition.